Tribestan is the world's most powerful tribulus terrestris product. Do not accept any imitations, just this clinically tested and unique product - Tribestan. 1. The right extract from the correct species of tribulus terrestris. 2. Tablets that are protected against moisture - unlike other products where the capsules are exposed to moisture and the scarcity of active substances is degraded. 3. A formulation which allows the active substance to be kept longer in the system. Increasing the content of protodioscin in other preparations based on tribulus terrestris is directed to deceiving the customer. These products simply use a low-grade tribulus terrestris extract that artificially complements protodioscin. The unambiguous and untouchable prevalence of Tribestan is based on the highest quality tribulus terrestris extract and is expressed in a biologically active extract with a balanced ratio of protodioscin, protogracillin and other key saponins in ratios that are key to their activity. Tribulus terrestris extract can easily become worthless when exposed to moisture. 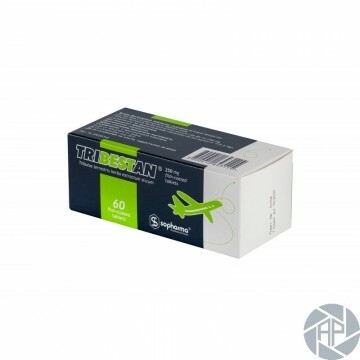 Therefore, Tribestan can be found in moisture-resistant coated tablets. Other tribulus terrestris products use encapsulated forms that are soon degraded by accessing moisture. The quality of the raw material used - tribulus terrestris - is one of the foundations. Other producers will say that they use a plant from Bulgaria, they will talk about its controlled cultivation, although tribulus is a wildly growing plant and grows in other parts of the world. However, Sopharma has tested plants from all available locations in the world and none is of such quality as to provide an extract with 45% or higher furostanol saponins. Even in Bulgaria, some locations do not reach this quality. Therefore, Sopharma, as Tribestan producer, uses only the best quality sources in Bulgaria after previous testing. To obtain 16kg of extract, 905kg of a quality plant is needed, while the complex extraction process is years proven and refined by Sopharma's drug producer.